Qualification : A Bachelor in Audiology & Speech-Language Pathology / B.S.C. (speech and hearing). from RCI recognized institute. Qualification : A technical person with a 1-year Diploma in Hearing Language and Speech (DHLS) from RCI recognized institute. 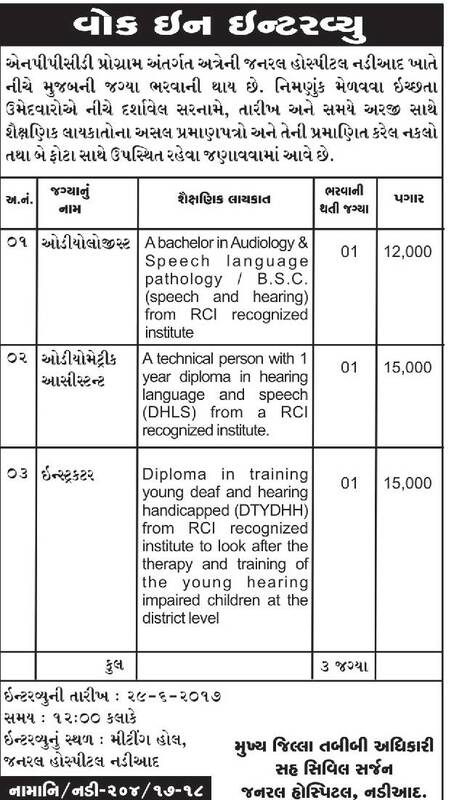 Qualification : Diploma in training young deaf and hearing handicapped (DTYDHH) from RCI recognised institute to look after the therapy and training of the young hearing impaired children at the district level. Venue: Meeting Hall, General Hospital, Nadiad. Interview Time : 12:00 p.m.